So maybe Fall of Cybertron Grimlock isn't your cup of tea. I can understand that. Some people just don't understand that a killer robot that turns into a t-rex is the coolest it gets without throwing in a unicorn. For that special breed I present the rest of the Transformers toys Hasbro was showing off at Comic-Con 2012. 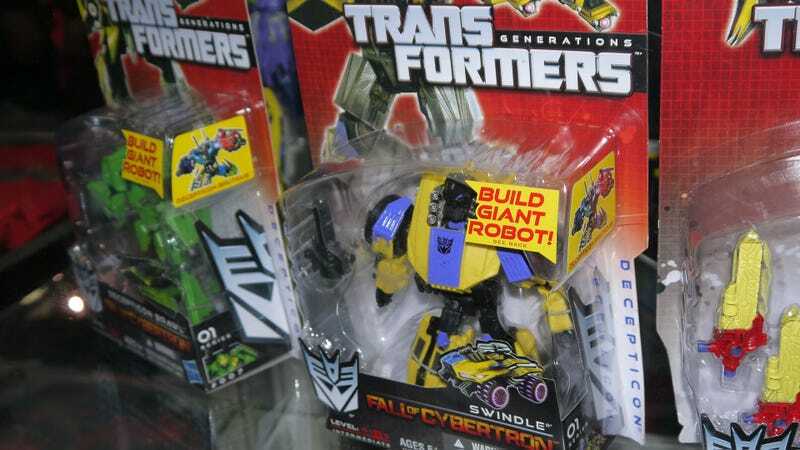 You Didn&apos;t Think Fall of Cybertron Would Come Out Without a Grimlock Toy, Did You? It's a great time to be a Transformers collector. We'vegot the Transformers Prime line kicking into high gear, delivering a pleasing mix of old-school design with a modern aesthetic. Then we've got the Fall of Cybertron line, featuring toys based on the primitive Cybertronian designs seen in High Moon Studios' upcoming console and PC title, including a brand-new combiner figure set and, of course, a certain big shiny lizard. Let's take a look at what Hasbro has in stores for us through 2013.